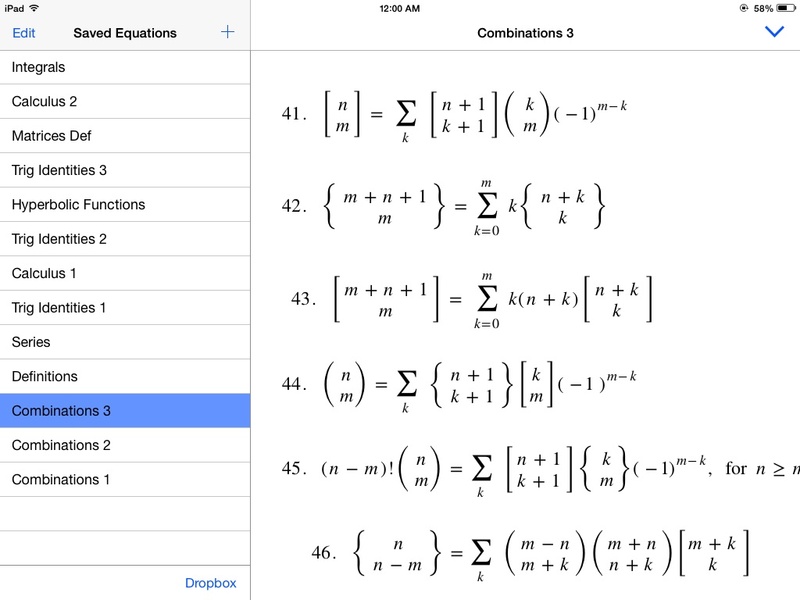 This version fixes a minor bug with PNG export of large equations. Many special characters which were exported as unicode characters are now exported using TeX macros (e.g. β = \beta). The ability to toggle whether you use $$ or \[ \] delimiters. 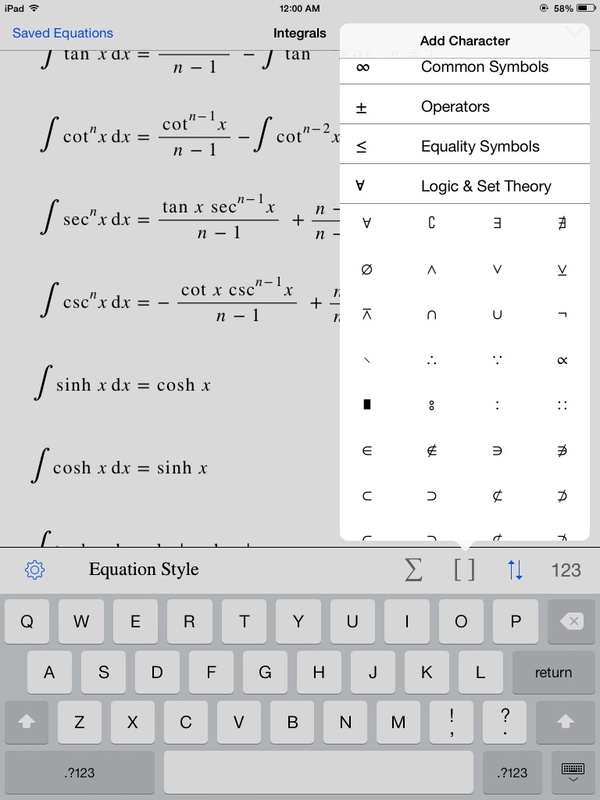 I have finished work on a free + in app purchases version of EQ Editor which allows you to create/edit an equation but adds a watermark to the output. Hopefully, this will get more people to try the app and decide for themselves. The current app version will remain unchanged and support will continue. This is just another option for some people. I will let you know when that app is released (waiting on Apple’s approval still). EQ Editor 3.0 is now live! The new website has been updated. The URL is: http://www.eqeditor.com/. I have removed the ability to download 2.x versions of the app. Hopefully, this should prevent people who are using iOS 6.0 or earlier from downloading the old app and being confused. This should mostly affect only iPad 1 users (sorry about that guys). Feel free to let me know if you all have any questions or concerns, either through this site or via email (support–at–eqeditor–dot–com). EQ Editor 3.0 has been submitted! Hopefully the new version should be approved by Apple shortly. This version adds many new features and improvements including full support for both standard and external keyboards (which shouldn’t seem like a big deal, but it is). It also adds greatly improved touch gesture support, and a much cleaner and easier to understand user interface. The rewrite and redesign took a large amount of time and effort, and I thank you all for your patience and feedback. I added code to allow seamless conversion of existing data, but please make sure to back up anything important before installing. 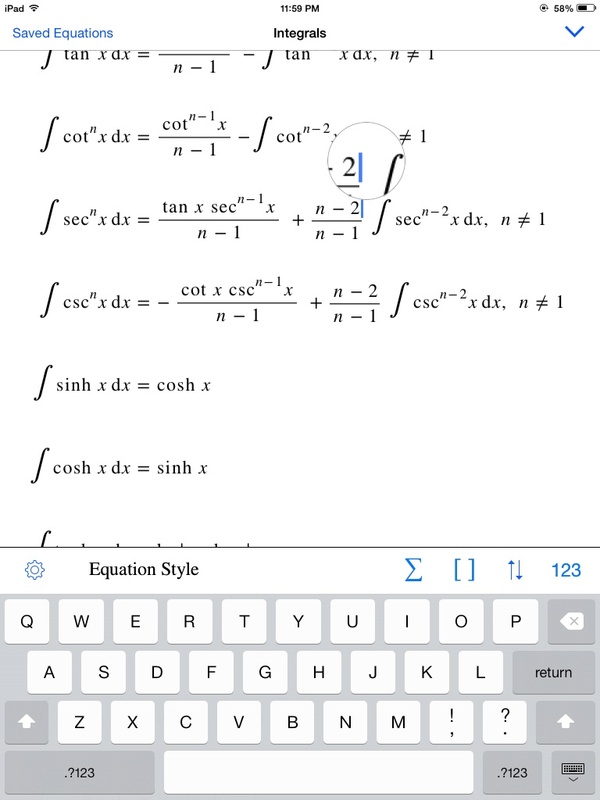 Just to let you know, I was able to include equation alignment and TeX export in the new round of changes. I don’t know if I got everything everyone asked for, but I hope you all are half as pleased as I am with the result. My goal was to create an equation editor that is easy to use and still produces excellent looking math, and I believe I’ve achieved it. I’ve registered http://www.eqeditor.com/ some time ago and will be working to change over to that in the near future. I will likely make that site more informational and still keep this site for other news posting. The new site does have its very own email address: support–at–eqeditor–dot–com. This address is now active, and that will likely be much more helpful for you all than posting comments here. I’ve gone ahead and pulled EQ Editor Lite, EQ Writer, and EQ Notebook. I don’t believe I have enough time to focus on updates for them. They may come back in some form as I’m still interested in developing technical writing tools, but I believe the focus should be on the one app for now. Thank you again for your support, I will let you know when the approval process is finished. Update: in very late testing. I hope to have the app update submitted to Apple next week. In the mean time, here are some screenshots of the current release candidate. I guess the big news is the interface is much more normal looking. It has the standard keyboard and gestures built in and even a loupe. 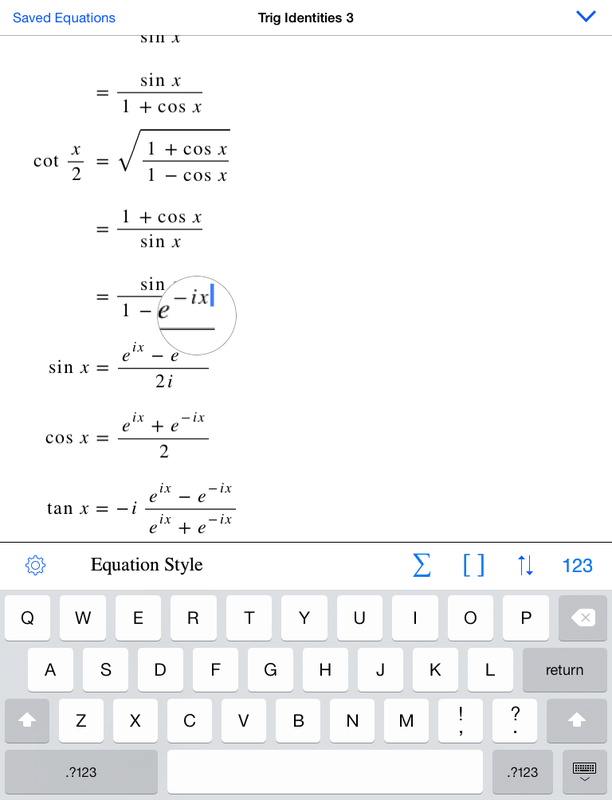 I have added a number of cool behind the scenes stuff like automatic text styling and equation alignment. TeX export is back as well. Also, the math rendering is much better. I’ve still got some final polishing to do, but I’m happy with the result and hopefully you all will be as well. Work continues at a rapid pace. I’ve finished with the updated draw code and much of the user interface and am working on the export code. The export quality of the PDF and images is much better than the current version and I’m very excited about the overall result to date. Hopefully you will be too! The release schedule looks on track for it to be submitted in ~ 6 weeks, though I would rather make sure it has all the features it needs and is thoroughly tested than release it too soon. While the main drive behind this release has been to remove all of the UI quirks and improve the typesetting results, I have been listening to your feedback and am working to add as much of these other features as I can into this release. If not, you can be sure that it the next release will be much sooner than the previous ones were. My work commitment has wrapped up and for the past few weeks I’ve been able to work on the new version of EQ Editor. The process is going well, but it is a complete from scratch rewrite of the code base, so it will not happen overnight. The aim is to finish everything up in the next 2-3 months. The new draw code has been rewritten using more clear typesetting principles. It is about 80% finished (still working on stretchy bracers and matrices) and looking much better than any previous version. I’ve also changed the way the data model works so that it uses Apple’s Text API directly, which allows the use of the standard keyboard (and even external keyboards). This also brings improved touch interaction which should drastically lower the learning curve for all users. In short, I’ve put a great deal of thought and effort into the upcoming version. Thank you for your feedback and (continued) patience! Although there is still a fair bit of work to do, the wait should be nearly over. I’ve been hard at work on a new, new revamp of EQ Editor. It’s been quite a bit slower as other work has taken up the bulk of my time. I am very excited about the work I have been doing, and I feel like the result will finally be close to the vision I’ve had for this project from the start. Just writing to let you all know that this isn’t “on hiatus” or vapor-ware and I do appreciate the support I’ve received. It’s just taking time. 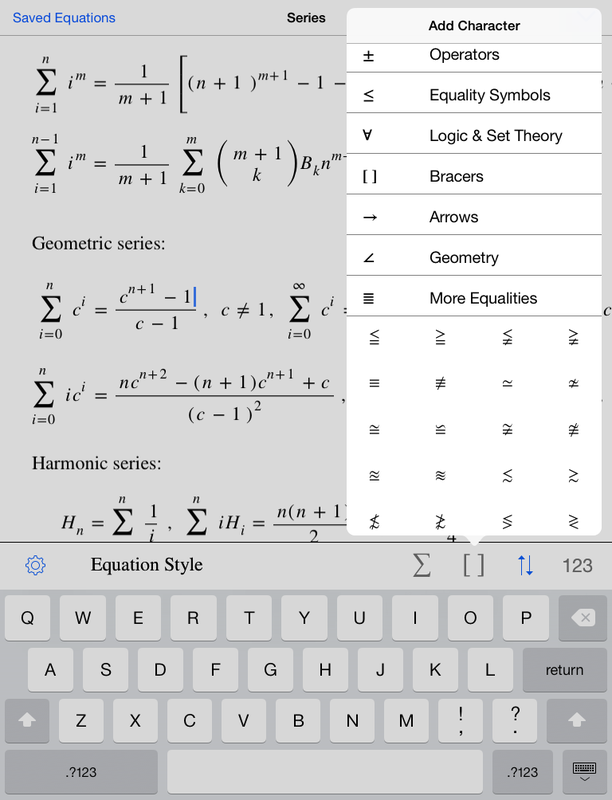 EQ Reader 2.0 is now available!